David Melton helped organize and start Branch 28 in Cabool MO. He has served as an officer in past years, and is currently serving his second term as President. David has spent many, many hours volunteering during Br 28 activities. He is proud supporter of EDGE&TA and makes lots of donations of time and money to help newer members as well as the old timers. David Melton should be inducted into the Hall of Fame for many reasons. Chief among these is the time he has spent organizing our facilities and activities. He is open minded to new ideas while keeping our goals and purposes in the fore front. He also has monitored the second and third generation in his own family and lots of other families. He was instrumental in developing a way for junior members to become involved in order to help provide for continuation of Branch 28. David has great leadership skills in that he is a great delegator and organizer for various personalities. He also takes an active role in educational activities that Branch 28 is involved in. David has spent a lot of time working to collect and preserve antique farm equipment. He has maintained a tractor owned by his late father. 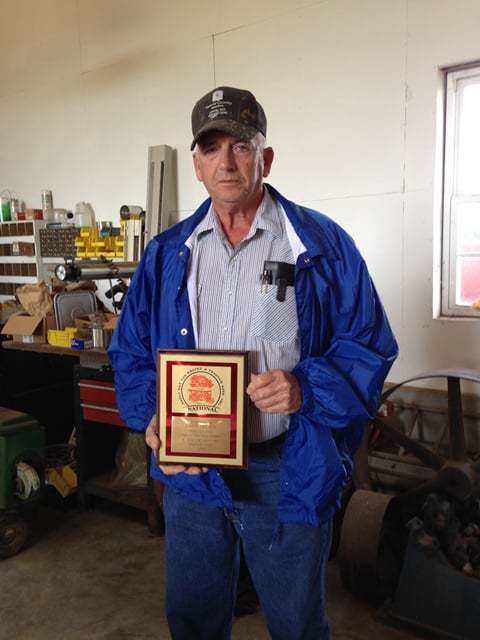 He has purchased other tractors and equipment over the years and truly likes to exhibit the various pieces in his collection. He participates in several shows and demos in South Central Missouri. He also takes part in our annual tractor drive and various parades in our community and surrounding area. His goal is to collect, preserve and exhibit antique equipment of all kinds and strive to educate the public about the agricultural heritage of our area. David and his wife farm and have a milking operation. Dave run a bulk milk pickup operation for many years and is always talking tractors and equipment to his farmer friends. If you need something he will always be there to help you. If you need a part for a John Deere tractor at a pull, he would take it off his tractor to help you. David, Becky and their 2 sons will load a 48 foot lowboy trailer and go to shows. We need more people in our organization to promote EDGEA like David does. He deserves the honor of being inducted into the National Hall of Fame.